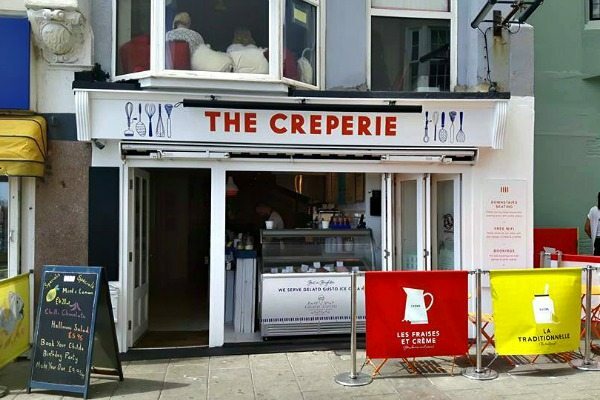 The Creperie are now completely gluten free! 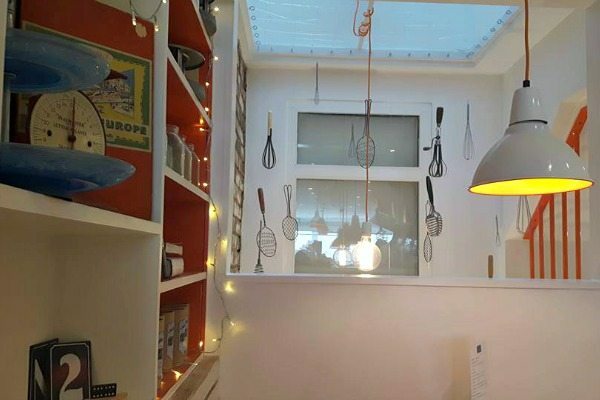 Right on the end of Ship Street, The Creperie boasts a fresh, bright, modern look which is tinged with references to its French inspiration, like the two clocks displaying both Brighton and Paris time. 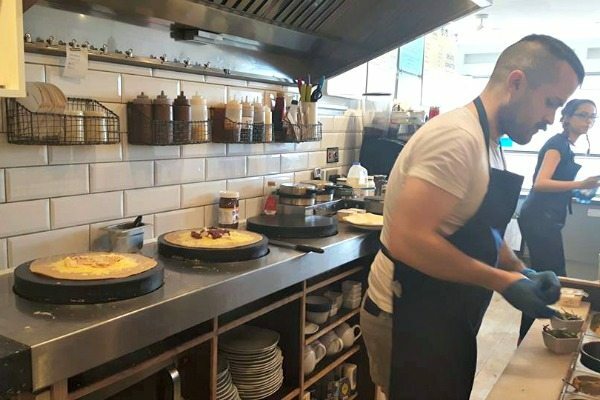 Crepes can be eaten in or taken away, and they are made efficiently at the small open kitchen in front of you. 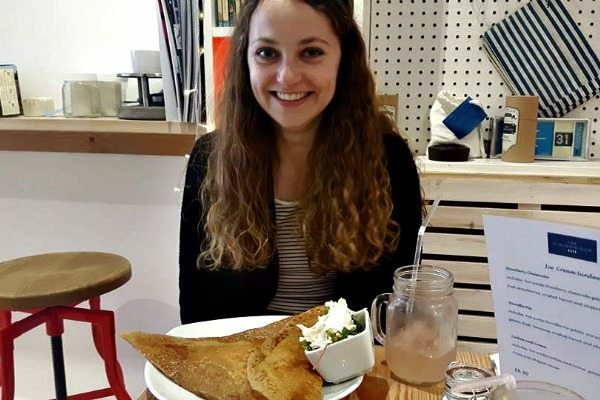 I visited the cafe with another Restaurants Brighton reviewer, Isabella. We took a seat and gazed at the delights on offer. But first: refreshments. 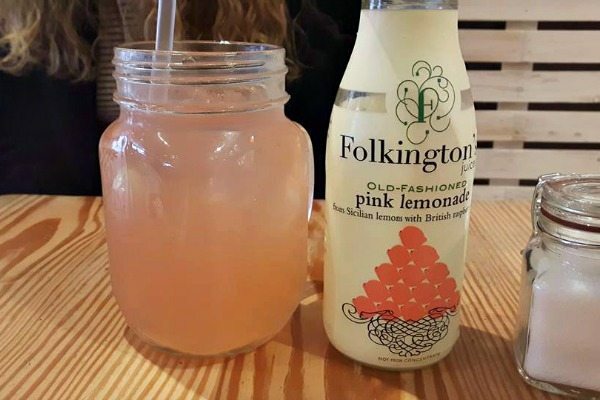 Isabella got the Folkington old fashioned pink lemonade with Sicilian lemons and British raspberries and it was delightfully refreshing, it tasted like it was made from real fresh lemons as opposed to just carbonated water with flavourings. 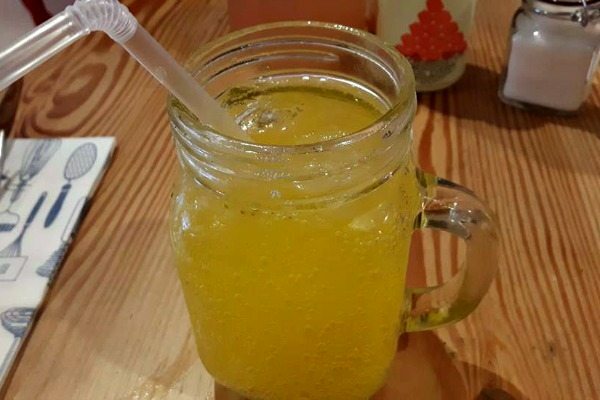 I ordered the bottomless fizzy drink, an option which is commonplace in America but reasonably rare in the UK – I’ve only had it at Nando’s (but maybe that just says more about me). Anyway, it was nice to see a business with this option, and I had the sunshine orange, which is basically posh Fanta. The menu is concise but bursting with very appealing options, so much so that it was tricky to come to the ultimate decision of what to order. There is also a breakfast menu and very appetising afternoon tea options, which staff were serving to a hen-do whilst we were there. Personally, I was caught between the tantalising French Blue, with Roquefort cheese, sun blushed tomatoes and pine nuts, and the Posh Cheese and onion, but eventually picked the latter. It has to be said, I kind of cheated and ordered a side salad which included many of the ingredients from the French Blue galette. This was just heavenly. Served with fresh dark green rocket leaves, the blue cheese was creamy but with a sharp kick complimented by the vinegary sun-blushed tomatoes and rounded off with the satisfying umami of the pine nuts. This salad was dressed gorgeously and altogether it was a beautifully rich and generously portioned side dish. 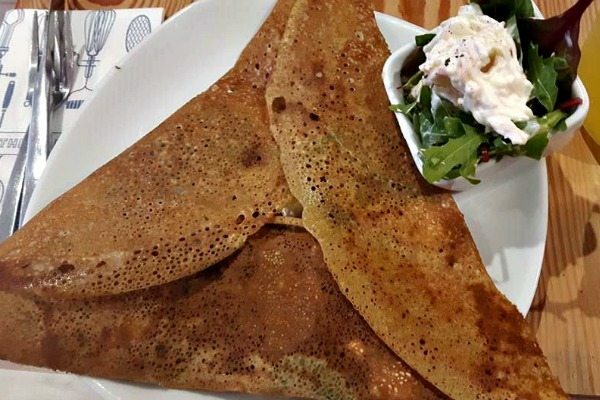 When the crepes arrived we could not believe the size – they barely fit on the plate. They come with the crepe folded over into a triangle shape; like a delicious present you have to unwrap it to get to the goodness inside. 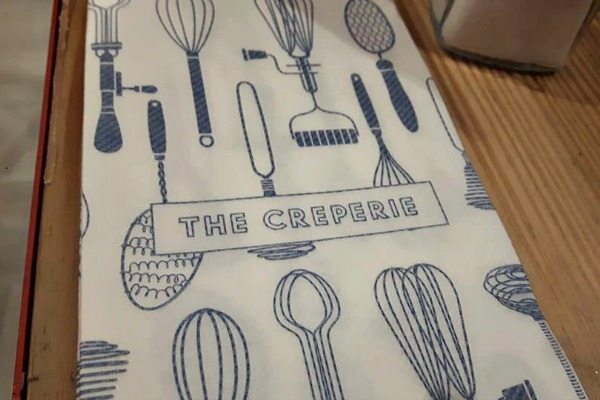 The crepes themselves were thin, light and crisp. However, Isabella actually put it really well: with a crepe it is all about the filling. And The Creperie really goes to town with theirs. 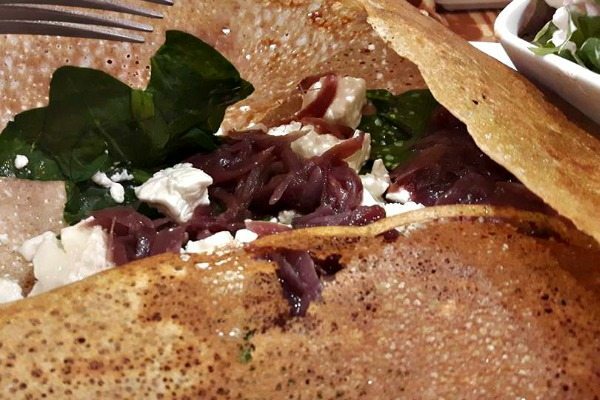 My Posh Cheese and Onion had the creamy strong flavours of big chunks of goats cheese countered by the sleek-textured spinach and subtle sweetness of red onion. Isabella ordered the New York Deli galette which is a combination of smoked salmon, cream cheese, lemon, black pepper and mixed leaves. She said it had a great balance of the cheesy cream with little slices of fish running through it. Both galettes came with a tasty coleslaw, which was lovely but forgotten about by the time you had demolished the main part. I am ashamed to say I could not finish mine and had to take it away to eat later; it is worth noting that the takeaway boxes are completely compostable and come with recyclable cutlery. 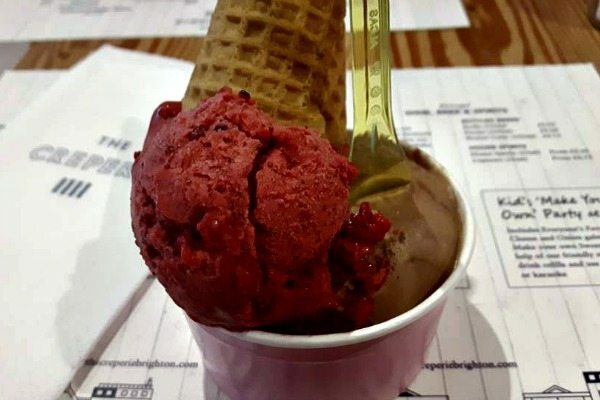 We had originally planned to try the sweet crepes or a waffle for dessert, but we were absolutely stuffed and so instead opted for a few scoops of Gelato Gusto’s ice cream which is sold at The Creperie. I had a scoop of the sumptuous Nuttyella flavour, which tasted just like the popular spread. Just plain yum. To balance, I also had a scoop of the fruits of the forest flavour. This was a smooth sorbet with the blooming fresh fruit tastes of lots of whole, sweet berries. The gluten free cones, we were informed, were very hard for the business to get their hands on, and they tasted great – just like a regular cone. Isabella chose a mix of sea salt caramel and Belgian chocolate. The latter she found really smooth and deeply flavoursome, with nice small chunks of chocolate, while the salted caramel was surprisingly not too sweet, but very tasty. 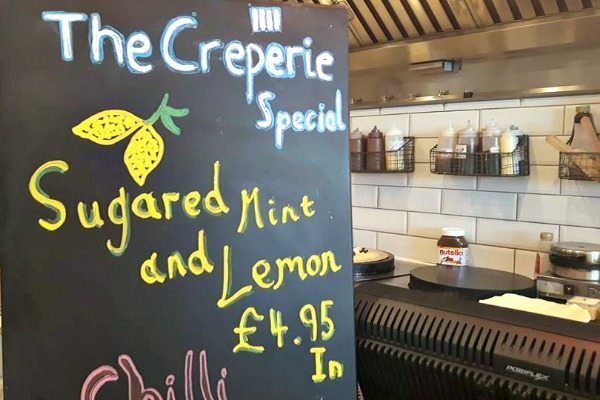 Some would say changing the whole menu to gluten free is a bold move, and perhaps it is, but to me The Creperie offers food at a dazzling standard, to those who eat gluten free and everyone else.